During my two years in South Korea, one of my favorite events was the annual Lotus Lantern Festival in Seoul. Held every May on the weekend closest to Buddha’s Birthday, the festival takes over downtown Seoul, with many activities and a fabulous lantern parade. The 2013 Lotus Lantern Festival will be held in Seoul from May 10-12. In my opinion, the two events to not be missed are the Lotus Lantern Parade and the cultural events held on the street in front of Jongyesa Temple in downtown Seoul. The Lantern Parade starts at 7pm on Saturday, May 11, and runs from near Dongdaemun Gate to Jongyesa Temple in Insadong. The parade features a fabulous display of over 100,000 lanterns, some small enough to be held by monks or other participants, and some large enough to require a truck. There are even a handful of moving lanterns including the always popular fire-breathing dragons. 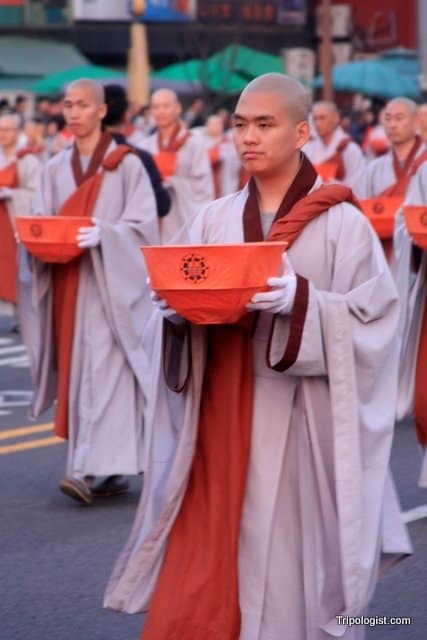 Buddhist Monks carrying lanterns during the Lotus Lantern Festival Parade. 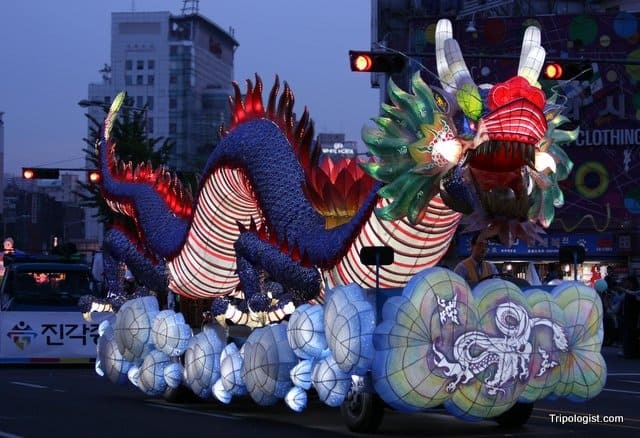 The parade lasts for about two hours and is one of the best cultural events in Korea. Make sure to arrive early in order to get a good spot from which to view the parade. From my experience, the area around Dongdaemun Gate is a great place to watch the parade. Not only is it less crowded, but, since it’s at the start of the parade route, you can get back to your destination earlier, avoiding some of the crowds watching the parade further down the route. The festivals activities continue on Sunday afternoon on the street in front of Jongyesa Temple in the heart of downtown Seoul. The street, which is closed to traffic for the day, features hundreds of tents featuring arts and crafts (such as lotus lantern and candle making), a variety of musical and acrobatic performances, food, and displays about Buddhism from other Asian countries. It is also worth heading into the grounds of Jongyesa Temple to see the beautiful canopy of lanterns that blanket the temple complex. The Lotus Lantern Festival is truly a fantastic festival to see; I can’t recommend it enough. There are several other events going on around the city in addition to the ones mentioned above. For more information about any of the events, check out the festival’s page at the Korean Tourism Organization website.